Snake sheds its skin, and transmutes into a new being. This is a symbol for our ability to shed beliefs and habits that we have outgrown. To be able to do this is wisdom. In Egypt, Snake was thought to represent inner vision. Unfortunately, the more rigid religious traditions seemed to fear wisdom. The Snake has been, throughout the ages, controversial in many regards. Some see the Snake as a bearer of evil or bad news, and some see the Snake at its deeper level as the healer and spiritual symbol that it is. Because it sheds its skin, the Snake has long been a symbol of life, death and rebirth. It sheds its skin as it outgrows the old. This death and rebirth cycle is part of what Snake represents. It has ties and significance to the ancient alchemists and their symbolic transmutation of lead into gold. This is associated with higher wisdom that comes with the passing of time. This cycle of death and rebirth is often symbolized by the Ouroborus, the Great World Serpent, an ancient image of a snake swallowing its own tail. It is the symbol of eternity. Before the snake begins to shed its skin, its eyes will begin to cloud over which gives the Snake a trance like appearance. To many mystics this indicated the ability of the Snake to move between the realms of the living and the dead, of crossing over from life to death and then back to life again, going from one step of life to another, transcending or leaving behind the old outmoded form for something new, something better. Most of us recognize the Snake as the symbol of physicians, which shows two snakes wrapped around a staff. This represents balance between two opposites: masculine and feminine, yin and yang, light and dark; because only through balance does true healing come. The Spirit of Snake is always involved in healing. It could be physical as well as mental or emotional healing. Snake has wisdom to impart. It could be the wisdom of the spirit world or the physical world. In either case, Snake wisdom will make your life so much better. Snake also represents power and life force. In Eastern traditions, the Snake is a symbol of Kundalini, or life force and creative juices being awakened. Snakes are highly respected in India and their lore and symbolism is highly regarded by their culture; Vitana, the mother of snakes, is the symbol of water and the underworld and the Goddess Shiva always wears snakes on her body as jewelry, which represents sexuality. American Indians also see the snake as a representation of fertility and healing. Are you in a time of transformation? Snake will teach how to let go and embrace the death and rebirth cycle. What have you outgrown? Is it time to shed the old and make way for the new? Snakes are deaf; they teach us not to listen to lies, especially the ones we tell ourselves. When snake appears, you can expect a transition or spiritual awakening to take place. Notice how the snake looks. A coiled snake usually symbolizes an awakening will happen. A snake ready to bite could indicate a need for you to defend your territory or personal beliefs. A snake shedding is representative of a death, usually a symbolic death, which will create a space for a new birthing to occur. Stand firm and in balance because you can handle whatever you are called to change. When we are ready Snake is always willing to guide us through the spiral of transformation. Only as high as we reach can we grow. Only as far as we seek can we go. Only as deep as we look can we see. Only as much as we dream can we be. To Prairie Dog, community is integral to life. Prairie Dogs greet each other with a hug, placing their forepaws around each other. They touch noses and teeth in a recognition ritual, and rub, lick and groom each other. They sleep communally. Prairie Dogs teach us about affection. They are very community oriented and work together as a team, especially in the case of impending danger when their cries signal all to take shelter. Prairie Dogs use a sophisticated language in their warning barks. At first, the short, repeated warning barks of the sentry Prairie Dogs may seem very much alike, possibly being general warning calls. These calls can be heard nearly a mile away. However, as Dr. Slobodchikoff from Northern Arizona University began to slow down the rapid barks and analyze them using electronic sonogram technology, he observed important differences. The barks when a hawk approached the colony were different from the barks when a coyote approached. His 20 year study of Prairie Dogs also revealed that their barks clearly distinguish between predator and non-predator, and included sounds for concepts such as size and color. Prairie Dogs live in a network of underground tunnels. This network is divided into individual communities in which the members all depend on each other. Thriving dog towns were as much a part of the West as Indians and buffalos. Their mounds and tunnels rejuvenate and aerate the soil. The entrance to their burrows may be fourteen feet into the ground, from there horizontal tunnels make up dens of food storage chambers, nesting and sleeping areas and latrines, with numerous side entrances into which Prairie Dogs can leap when in danger. These towns would spread through the grasslands for miles if left undisturbed. One Prairie Dog town in Texas is recorded to have covered 25,000 square miles, having as many as 400 million inhabitants. Remaining towns now cover only a square mile or so, with a few hundred residents. Every day Prairie Dogs rise before the sun, stand with their paws pressed together facing the rising sun in total stillness; and then at the end of the day take that same gesture just before the sun goes down. Prairie Dog wisdom teaches that strength and inspiration can be found by retreating into the stillness that quiets the mind. The strength of this medicine is also knowing when and how to replenish your life force. The Spirit of Prairie Dog teaches to seek self-empowerment in silence and inactivity, where one can access dreams and visions without the interruption of worldly chaos. So that as one reenters the world, they are profound and powerful anchors of peaceful determination in the midst of life's storms. Prairie Dog undeniably demonstrates a sense of community and family, a caretaker of everyone in a cooperative setting. Prairie Dog shows us how to create meaningful bonds and to reach out and make those long-lost connections to loved ones. Is there someone you need to get in touch with? Prairie Dog will assist us in examining our own social ability ~ too much or not enough? Is it time for you to openly show affection to your family, friends and neighbors? Do you need to learn to live with others, each sharing in the responsibilities? Do you need to get more deeply involved in the lives of others around you? Are you willing to speak for those who have no voice, against those who have no compassion? Now is the time to become more actively involved in community. Look deeply into the aspects of your life and discover what truly matters. Horse has made an alliance with humanity. For thousands of years Horse has helped us to carry our burdens, grow our crops, travel our roads, and even fight our wars. The Horse shows both earthly strength and unearthly powers. Horse is highly regarded throughout the world and connected with the magical powers of shamans. With the help of the Horse's speed, a person can cover long distances in a relatively short period. The Horse has also made transportation of goods a lot easier. It is, therefore, the first and foremost totem animal of civilization. The power of an engine is measured in horsepower.“Stealing horses is stealing power” is a statement made frequently in historical Native America and referred to the esteemed role which Horse played in the Native culture. One of the most striking things about Horse is their dignity. Even pulling a plow Horse maintains a noble bearing. Horse has shouldered burdens without surrendering their essential nature. Even after thousands of years of servitude when let loose to run wild Horse becomes in a very short time the untamed spirit he was destined to be. Perhaps this is Horse's greatest wisdom, the knowledge that no matter what we bear, there always exists in us the waiting seed of our true selves. Horse shows us how to carry our burdens with ease and with dignity, but more importantly, he shows us that we are always and forever free. One of the first things one notices about Horse is their impressive size and physical power. Horse is among the biggest and strongest of the animal kingdom, especially among those animals that have close interaction with humankind. Horse wisdom teaches us how to tap our own inner power and use it to enrich our lives whether that energy is used to run across the plains kicking our heels in joy and celebration of life, or to pull a plow while growing food to sustain life. 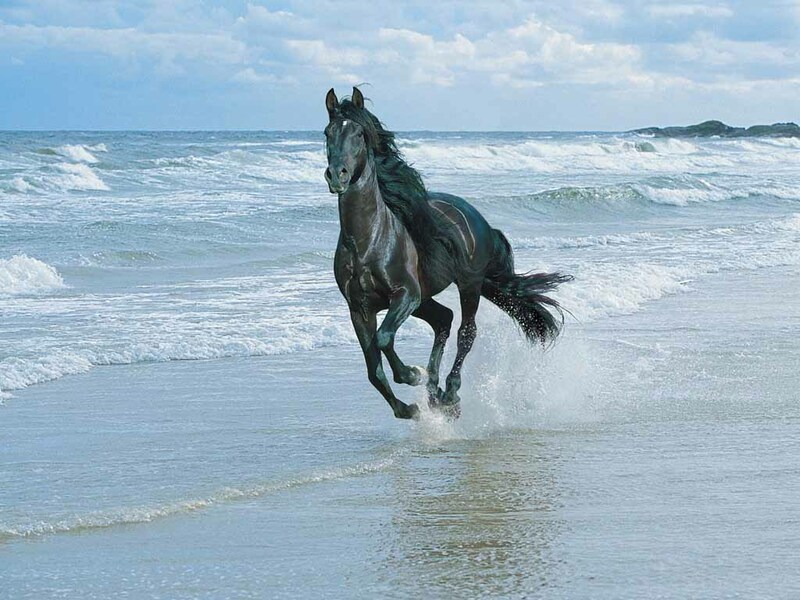 Call upon the Spirit of Horse for accessing your own power. Horses are very socially oriented and live in relatively permanent herds. Normally among animals, that form stable groups the males will, upon reaching maturity, strike out on their own while the grown daughters will stay in the mother's clan. However, Horses, both male and female, will leave the security of home to find, or form, their own herd. Summon Horse if you have not yet gained complete independence and need to stand on your own feet now that you are an adult. Horse medicine helps us to find our own place in the world. Anyone who has ever ridden a Horse knows that when he is trotting it is almost impossible to say in the saddle. However, when we allow the Horse to set his own pace and he begins to gallop, then riding becomes a pleasure. We become one with the Horse. Horse teaches us that when we give our heart and soul full rein and let our spirit find its own rhythm, then we will ride through our lives with beauty and grace. Riding a Horse conveys a sense of freedom. It teaches that power cannot be attained by force, but rather that it is given to those who are willing to accept responsibility in a respectful manner. Just as the Horse carries its rider on its back, the rider carries responsibility for everything around him. The power of the Horse is the wisdom to remember all the steps in one's life and learn from them. Real power is strength used with wisdom. Crows are the caretakers of the balance between physical reality and illusion. It is the Crow that can shape-shift back and forth through these realms bringing us wisdom and insight. If you look into the Crow’s eye, you will have found the doorway to the supernatural. Crow knows the unknowable mysteries of creation and is keeper of all Sacred Law. Human law is not the same as Sacred Law. Crow sees that the physical world and even the spiritual world, as we see them, are an illusion. There are many worlds. There is a multitude of creatures. Yet, we are all connected. The Great Spirit is in all. The Ancient Chiefs tell us that Crow can see the past, present and future simultaneously. Crow’s black color signifies the ability to move undetected between the dimensions of time and space. Crow brings change, for with each new thread of wisdom gained comes change. You cannot grow in a stationary state. Crow helps you make that step towards change. Crow wants you to look beyond what you would normally see, to expand your awareness and discover what it is that you attract into your daily life. Crow merges both light and dark, both inner and outer and when in the darkness of emotional pain and turmoil the Crow is the Carrier of Lost Souls into Light. He stands at the Gateway between shadow and light, watching for the Soul that is beginning to unfold, and then, with a beckoning call, Crow takes us from the darkness of denial into the light of awakening. Crows are considered to possess magical energies and in folklore have been feared as predictors of woe such as impending bad weather, death, or illness. Crows have been known to predict tornadoes, rain, and other changes in weather by the way they fly. Crows are extremely intelligent birds. They are adept at being aware of things around them and have been known to help birds and other wildlife when danger is near. Nothing escapes the keen sight of the Crow and it instills the wisdom to see things beyond the limitations of one-dimensional thinking. Crow calls to see beyond cultural limitations and the accepted rules of right and wrong. Crow teaches us when experiencing something new to watch closely to see what happens and then learn from it. Learn to recognize potential danger and be watchful in vulnerable times. Watch what you believe and question your ideas about reality against a more Universal standard. The Spirit of Crow represents the transcendence that will reveal the true path to your life's mission. Crows are also opportunists with the ability to make the most out of any situation, outwitting all the other birds and animals. As a totem, the Crow will help open you up to your fullest potential. The appearance of Crow is always a message to be prepared to gain something, some bits of wisdom, some form of inner vision or something you have been longing to understand. Crow's gifts are his voice and his keen insight. Crow is a wonderful teacher, so be a good student... one who is prepared to see far and speak with great clarity. Crow is bringing you a message from the Otherworld! The Wolf is the Birth Totem Animal for those born between February 19 and March 20. There is an ancient myth that says a very powerful shaman decided to try to turn all of the animals into human beings. However, the job proved too enormous for him, and he succeeded with only one thing ~ the eyes of the Wolf. Look into the deep, amber eyes of the Wolf and they will gaze back with that calm and unwavering stare, an expression of the self-esteem with which Wolves rightfully hold themselves. Wolves are like the humans in many ways, for they are social by nature, with a well-defined structure of social interaction defined by rules and rituals inherent to the life of the Pack. The Wolf also has ability for making quick and solid emotional attachments. If you were to keep company with Wolves, you would find an enormous sense of family within the Pack, as well as a strong individualistic urge. Its senses are so acute that it can interpret what is going on around it with a level of subtlety that is beyond our imagining. Wolf has a loose-limbed trot that is so effective and economical of energy that it can cover 50 miles in 24 hours, and do so for day after day. Wolves have extremely keen sense of smell, which is 100 times greater than that of humans. This sense of smell gives Wolf great discernment. The Wolf also has excellent hearing and this is a reminder that we should listen to our inner thoughts and words. This will strengthen and enhance our own intuition and discernment. Wolves, for much of the time, operate as a Pack. They have such an extraordinary degree of intuition that their understanding of one another's intentions often seems beyond normal explanation. Younger members learn from the older ones so that the whole group operates as a unified and highly skilled team. For all of these reasons, human hunters everywhere have admired the Wolf. Even today, the Native People of the North call Wolf ‘The Teacher,’ and honor its special powers with dances. The Wolf brings knowledge. Sometimes we need to cross barriers and take risks in order to learn and grow, even though crossing these boundaries may be frightening. We should not fear the inner power and strength we feel when we spend time alone. Instead, let us come to know Wolf as our guide to the Sacred Within, where we will find closeness and spiritual companionship. Above all, Wolf will teach us, through our experiences, to trust ourselves and not to fear or reject those parts of us that we do not yet understand or know. Wolf will guard us as it lovingly teaches us. With the spirit of Wolf, we will have the ability to share our personal experiences with others. As we step into a Higher Consciousness and share our truths, we will help others to understand themselves and their uniqueness better. The gift of wisdom comes to you when you have walked enough pathways and found enough dead ends to truly know the forest. In the discovery and rediscovery of every inch of ground comes the knowledge that nothing ever remains the same. The wheel of life is always turning. Each color of the Wolf ~ White, Brown, Gray, Black and Red ~brings a different lesson. However, they all bring one identical teaching: to be self-approving, to know who you are and to develop strength, confidence and surety in that so that you do not have to demonstrate and prove yourself at all. Wolves are the epitome of the wild spirit. Find a new path, take a new journey, take control of your life. You are the governor of your own life, you create it and direct it. Do so with harmony and discipline and you will know the true spirit of freedom. 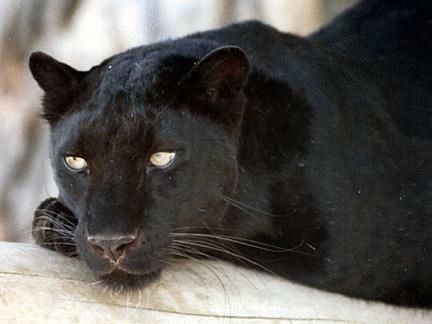 Of all the panthers, probably the Black Panther has the greatest mysticism associated with it. It is the symbol of the feminine, the dark mother, and the dark of the moon. It is the symbol for the life and power of the night. It is a symbol of the feminine energies manifest upon the earth. It is often a symbol of darkness, death, and rebirth. There still exists in people today an ancient fear of the dark and of death. The message of Black Panther is to make night your friend. Make yourself familiar with night animals. Work through your fears of death and the night. Study mysticism and do not be afraid of power. Black Panther sees into every soul. With her penetrating yellow-green gaze, she can also look into the future. Her message may be not to worry about the future. Trust that maybe you are not supposed to mentally ‘figure it all out’ at this time. In the myths and stories of Dionysus, the Black Panther is a symbol of unleashing desires, and so the awakening of the kundalini forces. The Black Panther symbolizes a time of moving from the limitations of mere existence into a new life without restrictions or barriers. It signals a time of imminent awakening as it awakens the unconscious urges and abilities that have been closed down within us. To the American Indians, the Jaguar, especially in the form of the Black Panther, was endowed with great magic and power. The Black Panther climbs, runs, and swims, even better than the tiger. Because it could function so well in so many areas, it became the symbol of mastery over all dimensions. To the Tucano Indians of the Amazon, the Jaguar was created by the Sun, and the Black Panther was the god of darkness and could cause eclipses by swallowing the Sun. This reflects the incredible natural power within the feminine forces. The Black Panther has over 500 voluntary muscles that they can use at will. For us, it reflects an ability to do a variety of tasks at will; it is simply a matter of deciding and putting to use those particular ‘muscles’ ~ physical, mental, psychic, or spiritual. Black Panther has very strong hearing. It can move its ears to locate the direction of sounds. To those who align with the spirit of Black Panther comes the ability to develop clairaudience. The Black Panther also has extremely sensitive hairs on its body, especially the face. The skin is the largest sensory organ, and we experience much more of the world through it than we realize. Pay attention to how you feel when someone touches you or when you touch something or someone else. The power of the Black Panther is the power of silence. It is extremely quiet when hunting or stalking. It knows when to make its presence known and when to become invisible. The Black Panther holds the secrets of unseen worlds and is associated with lunar energies. Within the darkness of night lies the truth of creation. Revealing too much or speaking too much about pursuits can counteract some of their effectiveness. An awkward young Swan was called an ugly duckling by the other young waterfowl in the lake. Seeing his reflection in the watery surface, he cannot help but agree, and hangs his young head in shame. The other birds refuse to play with the pathetic creature, and he is left to himself. At last, his mother finds him, and assures him that this phase will pass, and he will grow into the most beautiful bird of all ~ a magnificent snowy White Swan. And as time passes, so he does. This healing tale has been told for over a century to children who feel isolated, or feel they do not fit in, teaching them to look within to find their own inner beauty and radiate it outward. When their time comes, they will be transformed, and have the grace, beauty and eloquence of a majestic White Swan. The power of the Swan lies in accepting the gift of change. As the Swan surrenders to the higher plan of the Great Spirit, it evolves from the "ugly duckling" in its youth to a graceful adult Swan. The Swan teaches to bring consciousness into balance with all levels of being and develop ones intuition. The graceful Swan teaches us to ‘go with the flow,’ to release struggle and effort, and to know ourselves as the beautiful light beings that we are. Swan gives us the ability to handle change and transformation with grace and dignity. The Swan is a loyal creature, devoted to her family. The Swan will help you to find and develop your own grace and power. As a species, Swans mate for life. A Swan showing up can indicate the one you are with, or someone you are soon to meet is a soul mate. The Swan is associated with mystic regal qualities, and so you may well have power and respect in your community. She will also show you the value of service. Swans often mistake wet roads for rivers, which can lead to their deaths. You should make sure that you are always in touch with your world and do not become aloof. Swan symbolizes grace and beauty on many levels. It is associated with love, music, and poetry. In Roman mythology, Swan was sacred to Venus, the goddess of love. In Greek tradition, Swan is often pictured singing to a lyre. The cloaks of the Irish bards, who were both poets and musicians, were made of Swan feathers, and in the Irish saga, the Children of Lir, when turned into Swans, sang so sweetly that all who heard them, were calmed and slept peacefully. This and other Celtic legends of the transformation of humans into Swans illustrate the deepest meaning of Swan medicine. Grace is not simply the ability to live harmoniously on the physical plane. It is the gift of being at home in many planes of reality, to recognize that we are more than we appear to be. In Navajo tradition, the Great White Swan can call up the Four Winds. The Great Spirit will use Swans to work Its will. The Australian Aborigines saw the Black Swans as the wives of their All Father. In Hindu tradition, it was Swan that laid the Cosmic Egg on the waters, from which Brahma sprang. The Swan was the vehicle of Brahma’s wife, Saraswati, the Goddess of Wisdom, Education, and Music. In India, Swans represent the perfect union, and the spirit of Brahma. The Swan teaches that there is beauty in all things. Things are not as they appear outwardly. The Jaguar carries a long history in the lore and mythology of several indigenous cultures. According to Mayan beliefs, the journey of the sun across the sky and the darkness of night symbolized the eternal journey of human consciousness and its transformations. The noonday sun was compared to the Eagle, flying high in the sky. Then it plunges below the horizon, just as we plunge into the dark where we face our spiritual challenges and are transformed. The hidden sun was said to be Jaguar, whose spotted skin symbolized the stars glittering in the night sky. Thus, it was called the Jaguar Sun. Members of the Tukano tribe, from South America, believe the sun itself created the spotted cat to be his representative on Earth. They believe our sun gave Jaguar the yellow color of solar power and the growl of thunder, said to be the voice of the sun. The South American name "jaguara" means “carnivore that overcomes prey with a single bound." The Jaguar's powerful limbs carry them for hundreds of miles searching for prey. It is an agile climber and shows us how to attain goals through flexibility and steadfastness. Unlike many other big cats, the Jaguar has no rivals ~ no other predator can compete with this powerful cat. Jaguar is at home in the dark and has good night vision. It moves without fear and teaches us how to trust our personal instincts. It can awaken psychic sight. Jaguars live in caves and canyons close to a source of fresh water. In mythology, caves are associated with isolation and retreat, a place to go to facilitate soul work. Water is associated with the emotional body. The Jaguar is asking you to go within, release your fears, heal your emotions and awaken your inner sight. Jaguars are stalkers, they move slowly and cautiously towards their prey and at just the right moment, they spring without hesitation. This indicates that we too need to use patience, perseverance and caution, waiting until what we seek is right before us and then to spring upon it without hesitation or procrastination. Opportunities are likely to come fast and furious at this time so we also need to use discretion and discernment because not everything will feed us or our dreams and goals. Jaguars are solitary creatures; they hunt alone relying only on their own ability as expert hunters to catch their prey. The message here is that input from too many other sources is likely to be more confusing than helpful. By going it alone at this time, you can find that your own self-confidence and trust in higher guidance and abilities is apt to be greatly increased. Jaguar to the Cloud People of South America embodies great mystery and magic. Some of the most powerful Shamans carry Jaguar energy; they have the ability to move into realms and realities where others cannot follow at this time. Jaguar is offering those whom do not carry its medicine to experience more of this ‘great beyond’. It is time to work on developing your intuition, bonding more deeply with guides and totems through meditation and acting upon the guidance received. It is also a time of synchronicity, magic fills the air. Magic appears in many ways and forms, how it may express itself to you depends on your own liking. This is the powerful energy of the cave, going deep within Mother Earth to renew and heal the self. Bear teaches us how to be silent and still so that we may receive higher guidance and inspiration. Bear also teaches us how to meet all of our needs from within rather than from without. Of all the species, humans probably spend more time doing than being. We cannot shape shift our reality through constant action but through the focused thought and emotion of the mind and Soul. When one feels ill at ease, in pain or stuck, then we know our Soul is saying to us that there is a better way but we must slow down our breath and activity long enough to hear what is being said to us. Bear can teach us how to do this if we examine Bear's own cycles of living. Cycles of rest, sleep and dreaming, including daydreaming, are important. When Bears sleep through the winter, they are actively dreaming the reality they will encounter upon their coming out from their den in the spring. This dreaming is done in partnership with every other living thing they will encounter, from plants, to other animals, to rivers, streams and to Mother Earth herself. Bear knows specifically where to go to find the best of everything life has to offer because they have already dreamed it into being. Humans tend to discount their dreams. Dreams help to keep the body in balance, the mind strong and the emotions stable. It is also nurturing for the soul when we allow ourselves to dream. Dream your dreams and own them. Before Bears go into a deep sleep they store up enough body fat to survive the long winter months ahead and Bear’s message is that we too may need to set aside resources to help tide us over during the slow cycles of our lives. If you find yourself constantly rushing about and always doing, yet your hopes and desires never seem to materialize, then its time to turn to Bear and ask for guidance as to how to make better use of your time. Bears are very focused on doing what they know they need to be doing during the spring, summer and autumn. Those who constantly put off the time and energy needed to put into their own desires and dreams in favor of constantly helping others will soon find their energy used up. When we are constantly setting aside the things that bring us happiness and a sense of fulfillment because others always seem to need our help we are literally starving ourselves of life energy. We are allowing someone else to drain off our life force for his or her own needs and purposes. Find ways to serve that also teaches others how to fend for themselves and do not allow others to become dependant upon you. Allowing others to become dependant is not a gift for them. It only teaches them to become even more dependant and they never feel they are ever as capable of achieving things on their own. We each came to this earth with many wonderful and valuable gifts to share. Each of us has a contribution that only we can make. It is in the finding of and making that contribution to the world that allows the life force of the Universe to flow through us freely. Bear’s message is to set proper boundaries with others and focus your time and energy on those things that matter to you and to remember that if it is truly important for you to be doing, then you need to be totally committed to seeing the project through to the end. Sometimes one of the hardest things in life to do is to break off relations with another person. Bear reminds us that we must walk our own path alone. If we tie ourselves to other people or situations that are not for our highest good, then in reality we are miles off our true path. Remember that Bears do not gather in actual social groups. Watch how Bears act around one another when they come into contact such as at a common food or water source. Each Bear tends to define its boundaries and watches carefully with one eye what the other Bears are doing. Each Bear knows precisely what it needs to do and while there are battles from time to time if one Bear gets too close to another, for the most part each is very focused on going on with its own business. Defining and if need be, defending one's space or territory in and of itself is extremely healing for many people. It is important to define what your space is and honor it as sacred in whatever way you can. Be cautious as to whom you invite into your personal living space. Try to keep only those things in your home and environment that have great personal value and meaning for you. Create a nurturing sanctuary within your home so that when you return from the outside world, you can feel supported and rejuvenated. The Great Blue Heron is the King of the Marshes. It is the tallest of the Herons, and the most powerful in flight. It hunts with a slow, deliberate, stalking stride that seems to tell everything else to stand aside. The Great Blue Heron is a majestic bird who teaches us the wisdom of standing still; waiting patiently, while what we need comes to us. Allow the dignity of Great Heron to inspire you: practice walking with assurance and deliberation, taking your time and refusing to be hurried. You know what is best for you, and do not allow anyone else to change your path. Heron medicine is strong and courageous. It is not afraid to take responsibility for every aspect of life. It will never shift the responsibility, or deny an act or deed. It is the totem of character and strong will, but it will never use those gifts to bully or take advantage of others. If you know someone who is afraid to take control of their life, bring in the spirit of the Heron, it could make a difference. As a member of the Crane family, these large birds are distinctive in appearance in part due to their blue feathers, which can range in color from a dusky slate-grey to a deep blue. Their long legs and elongated neck, are also distinguishing characteristics of these splendid birds. surroundings, these birds are the picture of grace and stateliness, yet when in flight their appearance is a bit gangly as they fly with their heads supported between their shoulders, rather than stretched out before them as is typical of their White Crane cousins. These separating characteristics are part of a message the Blue Heron gives; to be individualists who utilize our own differences to bring forth change in the world around us. Sometimes there may be a need to disturb the status quo of society in order to bring about change and evolution. Although this is a trait with many challenges, when operating from its highest vibration, Blue Heron’s message teaches us the value and importance of each individual contribution to the whole. during mating season, Herons will gather in clusters to nest and raise their young in what are called colonies. It is quite remarkable to witness the peace and harmony that flourishes in these colonies, and is a demonstration to the ability of a highly independent creature to adapt to communal life. It is not uncommon to see a Great Blue Heron standing with one leg drawn up in a resting position, and balancing on the other leg. There is a message in this. There will be many experiences in learning to operate independently and to trust and rely heavily on ourselves. This can be a dual-edged sword however, as much as the Heron must find the proper equilibrium to balance on one leg, we must also learn the delicate balance and counter-balance between independence and cooperative loving and living with others. Therefore, this, also, is the message of the Great Blue Heron, we each must find within ourselves the ability to live in cooperative peace with our fellow human beings. The main focus is upon gaining enough self-confidence so that we are capable of relying upon our own highly developed sense of timing and action, and tempering it with embracing loving relationships that operate within healthy boundaries and involve necessary sharing and co-nurturing with the respect of individual freedom and independence. In the beginning, the search for peace and harmony may manifest as attempting to direct others to such a state, failing to recognize that peace must first come from within. it is within each of us." Because Frogs are found in the water and on land, they hold the magic of both. Water is associated with emotional cleansing. Get in touch with your feelings. Honor your tears, for they cleanse the soul. Mud, which is the combination of earth and water, is a well-known healing therapy to rid the body of toxins. Shamans felt that Frogs could make the quick and effortless leap from one stage of consciousness to another, thus they were a symbol of magic to them. The Frog was sacred to Venus the Roman Goddess of love and beauty. The Frog also has much legend surrounding it referring to it as a symbol of fertility. Many American Indian tribes refer to the Frog as the Great Rain Maker because they were thought to bring on the rains from above. Frogs are amphibians; this word translates to ‘double life’ because amphibians dwell on the land and in the water. Think about how Frog dwells in two worlds at once. Frog is a creature that can swim underwater for extended periods ~ actually they begin their life underwater ~ and yet, they must surface for air to survive. Like Frog, we must learn to co-exist in two worlds at the same time. We must find the needed level of detachment (air) or our emotions (water) or the emotions of others will pull us under where we will surely drown. Frogs will die if away from moisture for too long, and so Frog reminds us to refresh ourselves, and allow joy to moisten our lives and our hearts. If you are feeling ‘muddied’ by the world, take a moment to dream, to laugh, cry, and renew yourself. At times, all of life’s activities can be overwhelming, and everyone occasionally needs a break. Frog reminds us to cleanse our bodies, our environments and our auric fields. It is very important to learn how to recognize when people, situations and circumstances are draining energy, and to cleanse them out of our aura so that we may sing freely. The Frog is also a symbol of transformation. Most Frogs go through a two-stage life cycle. The Frog undergoes incredible transformation to reach the destination of full adulthood, and so do we humans. Eggs hatch into tadpoles, which grow and then eventually turn into adults. Frog’s message is to acknowledge the coming into own personal power. Find opportunities in transition. Frog understands what it is like to go through some serious growing pains. Jump into your own personal, creative power! The Weasel family includes Ermines, Minks and Ferrets. Various members of the Weasel family have a poor reputation among many people for being cowards. This is simply not true. In fact, they are bold and confident in taking on animals larger than they are. Also, members of the Weasel family are tenaciously aggressive. Weasels have been known to kill Hawks, who were trying to kill them. Weasel medicine, talent, and abilities put off some people, but there are no bad medicines. We all have power, or we would not be here to heal Mother Earth. Members of the Weasel family do not do things in half measures. They live life with all of their heart. Ferrets race down tunnels out of curiosity, while Minks travel great distances for fish. Folklore tells of Weasel’s ardent nature in confronting wrongs. Members of the Weasel family put their whole being into what they do. Learn from them to do the same. Experience life with all your senses. Live life fully but do not burn out while doing it, for Weasels have short lives. The Weasel as a totem animal relates to quickness and observation. 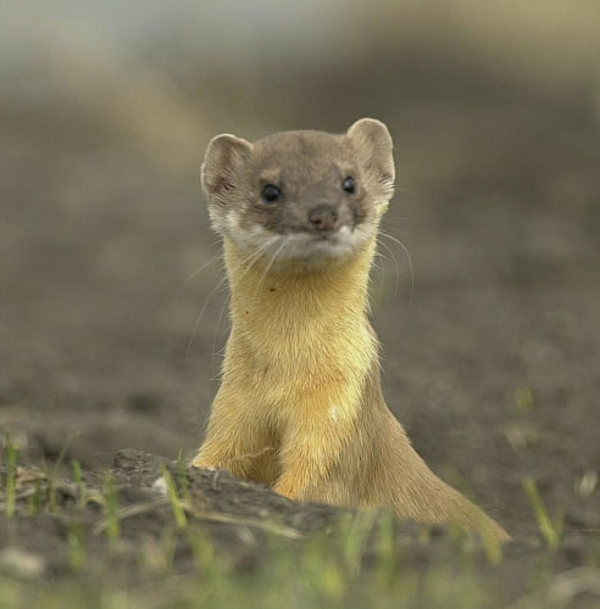 The Weasel encourages a higher level of observation - where observing and intuition combine to provide the observer with qualities of prediction of outcomes. This animal imparts the ability to see beneath the surface of things to what the actual intent and meaning is. The Weasel also encourages you to develop your sense of inner hearing and to pay attention to your inner voice. Searching out the meaning and cause of events, situations or problems is a positive trait of the Weasel spirit. Seeing beneath the surface of things enables the Weasel spirit to contemplate deeper meanings. However, sometimes this trait can have a negative affect because seeing too deeply can be burden. Silent and graceful, members of the Weasel Family go unseen and unheard about their territories. They quietly observe what is happening and then discern what is important. Since Weasels move unseen, scouting out their enemies, Native Americans sought blessings from Weasel, when going into battle. Ancient Greeks said that the Goddess of Retribution, Nemesis, took the form of Weasel to pursue justice. Carpathians believed that Weasel would attack by the thousands to avenge the death of one of their own. To honor Weasel, they held Weasel festivals on St. Matthew’s Day. Medieval Christians regarded Weasel as a spiritual warrior able to defeat the devil with faith. Use the spirit of the Weasel to observe what or who needs attention and offer assistance in your quiet or discreet way. Look to the Weasel power to tell you the hidden reasons behind anything. Weasel teaches us to trust our instincts to achieve higher awareness and quietly seek resolutions to problems. The long, thin and lustrous body of the Weasel allows it to move easily in small, narrow places. Part of the medicine of the Weasel spirit is to help you find ways to negotiate through difficult, tight conditions. In Ancient Egypt Alligators were venerated as gods, for it was believed they brought the rains that overflowed the Nile, which left the mud to fertilize the land. At the same time feared for their destructive power. The Alligator Medicine contains the unrestrained creative forces of the world, the passion and strength of Primal Energies. It is the symbol of creation and destruction. The powerful medicine of Alligator is to be grateful for and integrate all that life has to offer ~ to methodically process both the pleasures and the pains of life. Laugh in the face of conflict. Be flexible enough to scan more than just the surface; integrate all possibilities, possible dangers, unforeseen conclusions and ultimate rewards. Digest each situation before making any rash moves and avoid passing judgment until you have scrutinized all the facts and have looked at all sides of any situation. Alligator teaches us how to ‘roll with the punches’ when being hit by the circumstances of life. Have you been rushing through life and not taking the time to count your blessings? Or to digest your Rites of Passage? Honor your progress and remember quick fixes do not support long-term goals. Use calm resolve; review your healing process and life lessons, integrating the growth you have attained. "Alligator… Let me drop my judgments, Accepting life with grace, so that forlorn care and worry will vanish from my face. Let me integrate each moment, Digesting life with ease, Counting all my experiences as equal opportunities." Alligator's gift is awareness of the dangers, lurking below the surface waters of our emotional body. For Alligator, the key to survival is the suspension of judgment, even in the face of the great unknown. This is the path of ancient wisdom, for Alligator recognizes that we are all seekers of the soul. The celebration of Thanksgiving is one generally held around hearth and home, and Turkeys play a big part in this. Native American Indians view the Turkey as both a symbol of abundance and fertility. After heavy, uncontrolled hunting by European settlers and American hunters, the Turkey almost vanished to near extinction by the early 1900's. The Wild Turkey is a resilient bird and a survivor. When reintroduced, they renewed their populations very quickly, symbolizing the renewal and rebirth that must take place for all nature in order for humans to survive. Cultivate and care for those renewable resources that benefit your life. Wild Turkeys were almost eliminated because they were taken for granted. Remember that nothing is an endless resource if it is not honored or cared for. Turkey reminds us that nothing is permanent and that life is in constant flux. The key is to take nothing for granted. Instead, we must remember that all things are sacred. Are you relying on something or someone in your life that you always expect will be there, and are taking no steps to treat in a sacred way? Turkey is the symbol of the Mother Earth and her abundant harvest. All of Earth's blessings and the ability to use them to their greatest advantage are part of Turkey's teachings. The Turkey is also a symbol of sacrifice. In Turkey’s death, we have our life. This reminds us to act and react on behalf of others. Act not out of some sense of self-righteousness or religious guilt, but out of the realization that all life is sacred. In present day city-life, we are taught we need to acquire things in order to get ahead. The person with the most ‘toys’ ‘wins the game’. In some cultures, no one can ‘win the game’ unless the whole of the People’s needs are met. Many tribes practiced the philosophy of giving, called give-away. A tribal member may gladly give away all that he or she owns, and do without in order to help the People. A person who claims more than his or her share is looked upon as selfish or crazy, or both. The poor, the feeble, and the aged have honor. The person who gives away the most and carries the burden of the People is one of the most respected. Turkey is telling you that you have much to be thankful for, even if you can’t see it at the moment. Life is a wonderful gift and the world is full of abundance. And not only do we receive, we can also give back. What are you giving back? How are you helping to replenish what has been given to you? Turkey is asking you to be aware of the needs of others. Generosity sent out will be generosity returned. Genuine gratitude and willingness to give opens the door for good to enter. This cat goes by several names including Cougar, Panther, and Puma. These solitary and illusive cats are very hard to find in the wild. They are also the most widely distributed cats in the Americas. These mysterious hunters will pounce on their prey with a strong short burst of energy after studying its movements, never hesitating; showing none of its movement is wasted. The spirit of Mountain Lion can appear without being noticed and quietly take control of a situation. Mountain Lion will teach us to assert ourselves, and take control of our life so we can become leaders. Mountain Lion can bring decisiveness in the use of personal power. Its graceful swiftness shows us how to understand the natural flow of our environment and move into a position of leadership. Mountain Lion brings the power of balanced leadership. Make sure you are not speaking too sharply or holding on to something too tightly. The power, strength, and assertiveness of the spirit of Mountain Lion is often misunderstood. Allow Mountain Lion to assist you in balancing intention, power, strength, and grace in everything that you do. It is the balance of body, mind, soul and spirit. Mountain Lion can assist you in bringing out your power and filling your heart with it, which will enable you to take charge of your life. Call upon the courage of Mountain Lion and begin to learn the lessons of the ‘lion-hearted’. True leadership through gentle assertiveness is what Mountain Lion teaches. It is the understanding that all beings are potential leaders in their own way. Do not be tricked into believing that nothing else has validity except the ideas created by you. In taking the place of power that Mountain Lion gives, you must constantly be aware of keeping peace. You can never make everyone happy, unless of course, you lie to yourself or others. Therefore, the first responsibility of leadership is to tell the truth. Know it and live it. Refuse to hide in the cave of your own timidity or indecision. Roar with Self-Confidence, Roar with Authority, and don’t forget to Roar with Laughter! Lizard medicine is the shadow side of reality where our dreams are reviewed before we manifest them physically. Dreams show us what we do not see when awake, they contain some of the subtlest perceptions of the mind. Make a dream log and record your dreams. Look for symbolic and reoccurring dreams and study them carefully. Lizards usually reflect heightened sensitivity. They are sensitive to vibrations in the ground. They feel it with their feet, tail and body. Their eyes are sharp with an ability to detect the slightest movement around them. They also have acute hearing. Lizard Medicine teaches the ability to perceive subtle movements – physical and ethereal, waking or sleeping. It is telling us to listen to our own intuition above anyone else's. One of the most significant characteristics of some lizards is the ability of the tail to come off. A predator may grab its tail, only to be surprised as the tail breaks off and the lizard is free. The lizard then begins the process of growing another in its place. However, they can only do this once. This detachment is also part of lizard’s message. They can help us to become more detached in life to survive. Sometimes it is necessary to separate ourselves, or part of ourselves, to accomplish what is necessary. The lizard helps us to awaken that ability for objective detachment so that it can occur with the least amount of difficulty. Lizard can show up to help us break from the past. It may even indicate a need to explore new realms and follow our own impulses. Since the lizard can only discard its tail once, this advises us to make wise decisions for what we decide can follow us around for a long time. If something is not working, it is time to let it go. The Heron is symbolic in many cultures. A double-headed Heron in Egypt is symbolic of prosperity. As a Chinese symbol, the Heron represents strength, purity, patience and long life. In Africa, it was believed that the Heron was able to communicate with the Gods. The Iroquois tribe held the Blue Heron as a good omen. They recognized the Heron as an expert fisher and hunter. As such, they believed that seeing a Heron before a hunt was a sign that the hunt would be a good one. The Medicine of Blue Heron is stability and the ability to progress and evolve. It allows you to perform many tasks at the same time, keeping all in balance. The Heron has a strong connection to the element of Earth. Mother Earth is your source of strength to help you stand strong and firm. Herons are often seen standing motionless, as if in a meditative state, on its long thin legs. This symbolizes the ability to maintain balance through proper focus; its inner foundation is secure but not fixed. As a water creature, the Heron is a symbol of going with the flow, and working with the elements of Mother Nature rather than struggling against her. The Blue Heron is asking you to dive into the watery world of feelings to seek your truth. Heron teaches you to develop your self-reflective skills so that you may come to truly know yourself. However, too much self-reflection can lead to self-obsession or self-criticism. Beware! Looking at yourself through the hazy lens of self-importance, the cloudy perceptions of low self-worth, or the narrow-minded eye of self-pity, you will never understand your true potential or understand the opportunities that appear. Keep passionate thoughts and feelings under control in order to maintain balance. It is unwise to drown the sense of joy that can come with the journey of self-discovery. You can learn some of your most valuable lessons through your mistakes. Balance your desire to change with gentle discernment. There are many layers of truth to understand and wholeness is impossible to achieve in just one dive. Heron is now calling you to delve deeper, to know yourself, and to trust your path. Like the Phoenix, who rises from its own ashes, Heron emerges from the unseen worlds of spirit into a new balanced sense-of-self in order to embrace its potential again and again. Herons stand out in their own uniqueness, by observing its actions and its lack of action you learn how to perfect your own personal flight through life. You know what is best for you and you should follow that path. Be aggressive when opportunities present themselves. Do not let them get away from you! Heron reminds you that every traveler on life’s journey is a messenger, and that every destination is the beginning of a new life cycle on the Medicine Wheel. An Elk's incredible stamina enables them to run for long periods of time, while their strong reflexes allow them quick response to anything in their path. Elk's regal demeanor reminds us that if we are confident, we can claim our empowerment. It teaches us to maintain and protect ourselves by taking time out. Elk realizes it is important to remain closely connected with community, and be observant of subtle energies. If you find yourself becoming sluggish, try a more vegetarian diet and in a couple of days, you will recover your stamina. And don't forget to replenish yourself with some personal quiet time. Elk is telling you to look at how you choose to create your present path, and how you intend to perpetuate it to reach your goal. Stop when you need to, persist when you need to and allow room for change and exchange of energies.